43 real world problem solvers. 29 community and business leaders. Thank you to the 180 talented Tama County hands that came together to volunteer their talents and/or resources to produce the 2011 Tama County Development Connections Magazine. This annual publication takes a snapshot of how real world problem solvers in rural Iowa shape our long-term economic potential instead of waiting for others to recognize and act on market opportunities. Congratulations on another year of progress, Tama County. You make us proud to be your partner in growing our assets. 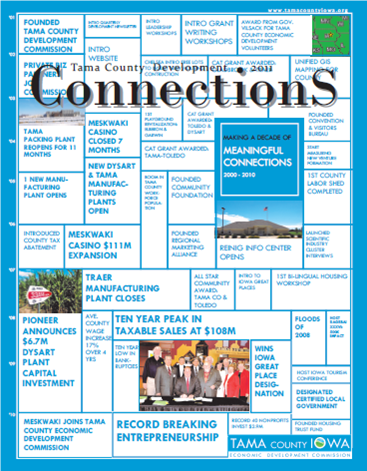 Tama County businesses, nonprofits, government offices and community leaders actively involved in Tama County Economic Development should receive their copy of the Connections Magazine in the mail today. Please let us know if you would like to be added to our primary leadership mailing list. Free copies are also available for the general public at city halls, libraries and professional office waiting rooms across Tama County. Shipment to our capacity building partners outside the county is also scheduled to go out over the next week. Online copies are also available by clicking on Tama County Connections Magazine 2011. ← Utilities Update: Tama County, Iowa has the best rural water in the USA?